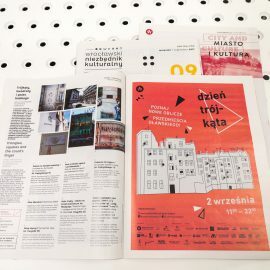 „Wrocław Cultural Guide” is a magazine about Wrocław culture, published by Strefa Kultury Wrocław. It is the only cultural newsletter of that kind in the city. 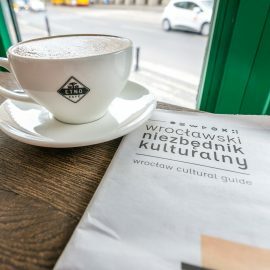 The current form of the “Wrocław Cultural Guide”, developed and completely refreshed, combines a timetable presenting the events which are currently taking place in Wrocław and the opinion journalism section which includes interviews, columns and announcements of the most important cultural projects. 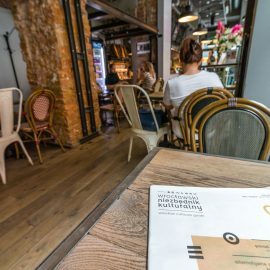 The Polish and English magazine with a Ukrainian supplement comes out every month and it is dedicated to the citizens of Wrocław and surrounding areas, as well as tourists and visitors. In order to make the access to culture possible and easy, the magazine is available free of charge in about 300 different places, including catering establishments, hotels, hostels, libraries, bookstores, cultural institutions, cinemas and tourist information points. We would be happy to develop an advertising relationship with you.